What a great way to kick off the new week – The highly anticipated book, vSphere 4.0 Quick Start Guide: Shortcuts down the path of Virtualization, has arrived at Amazon.com! I look at this new release as the 2nd edition or vSphere edition of RapidApp’s Quick Start Guide to ESX 3.0 which is still available and was a huge success. The vSphere 4.0 Quick Start Guide was written by a lineup of new authors who are well known rock stars in the virtualization community: Bernie Baker, Thomas Bryant, Duncan Epping, Dave Mischenko, Stewart Radnidge, and Alan Renouf. I obtained a preview copy of this book at VMworld 2009 in San Francisco and I can tell you that this it is absolutely amazing. Nowhere else will you find as much information in such a small and convenient footprint. Its small size allows you to put it in your pocket and take it virtually anywhere: On the plane, on the bus, into a meeting, or into the datacenter. As with the first edition, there are several blank pages in this book which allow you space to write down notes, command line information, configuration maximum changes, information about your environment, helpful URLs, etc. The authors did a great job on this book and considering the cumulative years of experience and combined expertise packed into this book, you can’t beat the price. I don’t think a better value exists. My copy has been traveling with me daily in my laptop bag. I give it two thumbs up. I recently rebuilt a vCenter Server on a new Windows host having a different name than the vCenter Server host used previously. Wanting to maintain my existing datacenter configuration and layout, I chose to connect to and preserve the existing SQL database back end. The installation went well and my existing datacenter configuration was in tact, however, I noticed one anomaly having two symptoms. After establishing a vSphere Client connection to the new vCenter Server named vc40.boche.mcse, the vSphere Client title bar showed jarjar.boche.mcse which was the old vCenter Server name. Furthermore, the Update Manager plugin was failing to load because it could not establish a connection to jarjar.boche.mcse. I wasn’t surprised a connection could not be made since jarjar was retired and no longer on the network. But why was the legacy vCenter Server name persisting in my new installation? At first, I thought there was some funky DNS reverse lookup going on but I was able to quickly rule that out when I remembered that I had assigned a new IP address to the new vCenter Server host. I quickly came to the conclusion that there was a row in the SQL database tattooed with the old vCenter Server name which was showing up in the vSphere Client. 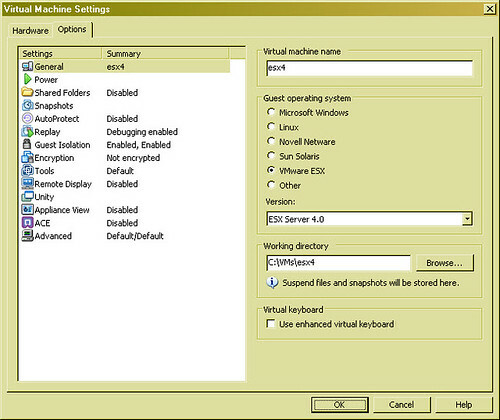 With that thought in mind, I used the vSphere Client to access the Administration|vCenter Server Settings menu option. Afterwards, the vSphere Client title bar was updated with the correct name of the vCenter Server vc40.boche.mcse. No reboot or recycling of any services needed. The Update Manager plugin had also followed suit, making its connection to the correct vCenter Server name instead of the old one which no longer existed. Simple stuff but I thought I’d write it up in case anyone else ran into this and was pulling their hair out. As I had pointed out in this blog post, VMware hints that 64-bit may be the future for vCenter Server. I decided that for my upgrade to vCenter 4.0 Update 1 this weekend, I would take the opportunity to rebuild my vCenter server from Windows Server 2003 32-bit to Windows Server 2008 64-bit. Once the 64-bit base operating system build was complete, I installed the 64-bit Microsoft SQL Server Native Client drivers (downloadable here) since my back end database is Microsoft SQL Server 2005 on a remote server. A key thing to remember about this installation is that it installs both 64-bit and 32-bit DSN drivers. The next step is to create the vCenter ODBC DSNs. Although vCenter Server runs on 64-bit operating systems, it currently requires a 32-bit ODBC DSN. 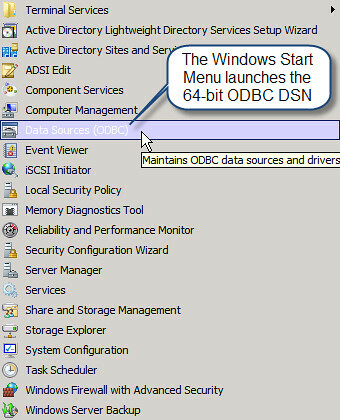 This is important to remember because the Windows Start Menu launches the 64-bit ODBC DSN tool, not the 32-bit version I needed. The vCenter Server (and Update Manager) installation will not complete without a 32-bit DSN. 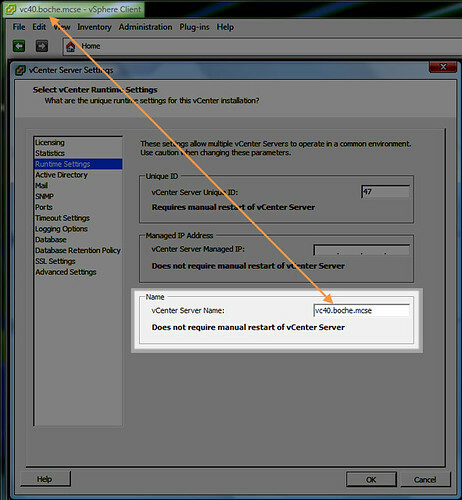 Proceed with the creation of the vCenter Server and Update Manager ODBC DSNs and complete the vCenter Server and Update Manager installations. This information and much more can be found in the ESX and vCenter Server Installation Guide, page 73. 64-bit vCenter Server Coming? VMFS-2 Support Going Away? I’m hoping this won’t be a deal breaker for anyone as we should all have 64-bit hardware in the datacenter by now. However, we may be temporarily inconvenienced with Windows Server platform upgrades from 32 to 64-bit. In the same document, I also noticed verbiage about VMFS-2 support going away in future vSphere releases. If you’re not completely rid of ESX2 and VMFS-2 in your environment by now, I’d start planning on it soon. While the Dutch and UK bloggers sleep, VMware has released Update 1 for ESXi 4, ESX 4, and vCenter 4. 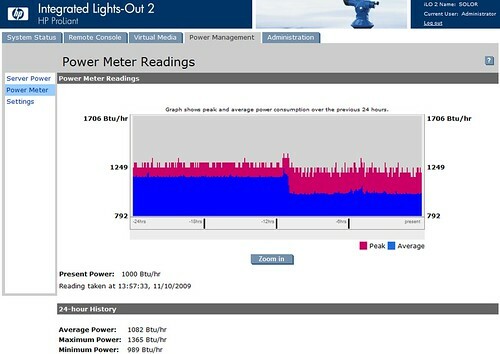 A casual Twitter tweet about my power savings through the use of VMware Distributed Power Management (DPM) found its way to VMware Senior Product Manager for DPM, Ulana Legedza, and Andrei Dorofeev. Ulana was interested in learning more about my situation. I explained how VMware DPM had evaluated workloads between two clustered vSphere hosts in my home lab, and proceeded to shut down one of the hosts for most of the month of October, saving me more than $50 on my energy bill. static – The default. The VMkernel can detect power management features available on the host but does not actively use them unless requested by the BIOS for power capping or thermal events. dynamic – The VMkernel optimizes each CPU’s frequency to match demand in order to improve power efficiency but not affect performance. 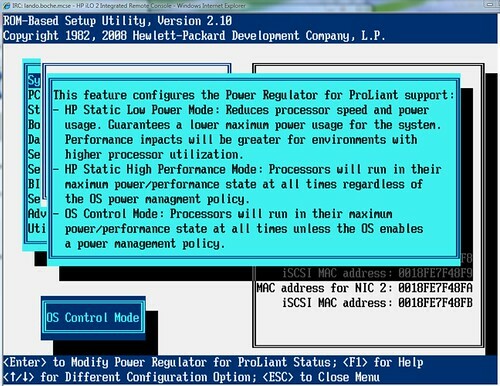 When CPU demand increases, this policy setting ensures that CPU frequencies also increase. You might be asking yourself by this point “Ok, this is nice, but what’s the trade off?” Note the wording in the dynamic definition above “improves power efficiency but does not affect performance”. This is a win/win configuration change! A Btu is heat – explained more at wiseGEEK’s What is a Btu? Heat is a byproduct of technology in the datacenter and in most cases is viewed as overhead expense because it requires cooling (additional costs) to maintain optimal operating conditions for the equipment running in the environment. If we can eliminate heat, we eliminate the associated cost of removing the heat. This is known as cost avoidance. Eliminating heat is as much of an interest to me as reducing my energy bill. The excessive heat generated in the basement eventually finds its way upstairs causing the rest of the house to be a little uncomfortable. The air conditioner in my home wasn’t manufactured to handle the excessive heat. Now, I live in the midwest where we have some frigid winters. Heat in the home is welcomed during the winter months. I could turn off CPU Power Management raising the Btu index as well as my energy bill, in favor of reducing my natural gas heating bill. I don’t know which is more expensive. This could be a great experiment for the January/February time frame. I’m excited to see what next month’s energy bill looks like. VMware Workstation 7.0 Released – New and Improved! If you’re a regular follower of my blog, you’ve probably noticed that I typically focus on Datacenter products. I am a VMware Workstation user as well. VMware’s inaugural product is the first hypervisor I ever used and has a lot to do with my career shift and focus on the exciting world of virtualization. Although I don’t use Workstation quite as much as I used to, I still like to keep current with new releases. As a Virtual Infrastructure user, one reasons for this is that I get a preview of features in Workstation that will eventually make their way to Virtual Infrastructure in the product development cycle. VMware Workstation 7.0 was released on October 27th and boasts an array of new features as well as support for new guest operating systems. I upgraded last week and started taking a look around. Having not read the “What’s New” release notes yet, I had noticed some features that, to me, looked new or improved. “Q: Can I switch between VMware Workstation 7 for Windows and Linux? This was the extent of my observations thus far while using VMware Workstation 7.0. If any of the items I talked about above existed in previous versions of VMware Workstation, please let me know. Since I do not use Workstation as much, it is possible that I missed an item or two while using an earlier version. Windows 7 — Create and run Windows 7 32-bit and 64-bit virtual machines using VMware Workstation. VMware Workstation has been enhanced for performance and to take advantage of the new Windows 7 features including Live Thumbnails and Aero Peek. Aero Glass — A new Windows Display Driver Model (WDDM) graphics driver has been developed for Windows Vista and Windows 7 virtual machines. The WDDM driver can display the Windows Aero user interface, OpenGL 1.4, and Shader Model 3.0. For more information on the VMware recommended graphics hardware, see the VMware Workstation User’s Manual. Windows XP Mode Compatible — Import a Windows XP Mode virtual machine using VMware Workstation 7.0 and run the virtual machine without being prompted to enter a Windows XP license key. VMware Workstation enables the Windows XP Mode virtual machine to take advantage of more than one processor, render high-end graphics, integrate seamlessly with Unity, and transfer files easily with drag and drop, and shared folders. VMware Workstation also has the ability to run concurrently with Windows XP Mode. 3D Graphics Improvements for Windows XP guests — OpenGL 2.1 and Shader Model 3.0 support is now available for Windows XP virtual machines. The XPDM (SVGAII) graphics driver works with Windows XP, Windows Vista, and Windows 7. However, only Windows XP virtual machines install the XPDM graphics driver by default. To switch graphics drivers in the guest operating system, see How to Switch Between SVGAII and WDDM Drivers. vSphere 4.0 and ESX Support — Install and run ESX 4.0 as a guest operating system. VMware Certified Professionals (VCPs) and technical professionals can install the latest server virtualization software and experiment with server setup, conduct training, show demos, and test production configurations. Running ESX as a guest eliminates the need to have spare hardware available to run ESX natively and enables ESX to run on systems that are not listed on the ESX hardware compatibility list (HCL). For more information on the supported processors and host operating systems, see Considerations for Running an ESX Guest. This feature is intended for educational and demonstration purposes only and should not be used in production environments. To use this feature, you must download vSphere 4.0 from the VMware Web site and follow the installation documentation provided with vSphere to install ESX. Virtual Printing — Print from virtual machines without mapping network printers or installing printer drivers in the virtual machine. With virtual printing enabled in the virtual machine setting, all of the printers installed on the host operating system are available in the guest operating system. This functionality is enabled through a partnership with ThinPrint, Inc. Four-Way SMP — Create and run virtual machines with a total of four processor cores, which can consist of four single-core processors, two dual-core processors, or one quad-core processor like the new Intel i7. 32GB Guest Memory — Run virtual machines with up to 32GB of memory using VMware Workstation. 256-bit Encryption — Secure your virtual machines with AES256-bit encryption to prevent unauthorized users from accessing or running the configuration files. AutoProtect —Schedule snapshots of your virtual machine to be created at a regular interval to ensure that you always have a snapshot available to revert to when needed. Advanced Linux Sound Architecture (ALSA) — ALSA significantly improves the sound of virtual machines running on a Linux host and streams the audio from each virtual machine on a separate channel so that multiple virtual machines can be heard simultaneously. Cross-Platform License Keys — Use the VMware Workstation 7.0 license key on both the Windows and Linux versions. Make sure you read the EULA for the terms and conditions that must be met when switching platforms. Pause a Virtual Machine — Free your CPU resources instantaneously without powering off or suspending the virtual machine. Expand Virtual Disks — Increase the size of the virtual disk from within VMware Workstation. For Windows Vista and Windows 7 guests, the disk partitions can be adjusted without the use of additional software. 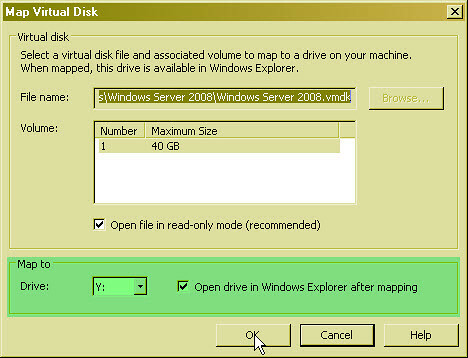 Compact Virtual Disks — Reclaim unused space from a virtual disk so that the host or another virtual machine can use it. Shared Folder Compatibility — Increased compatibility with many Windows applications that previously were unable to read or write files to shared folders. On-Demand VMware Tools Download — On-demand download capability provides the latest VMware Tools for the guest operating system. This feature reduces the overall download size of VMware products by downloading only the required set of VMware Tools and and enables VMware to release new versions frequently. Drag and Drop Enhancements — Drag and drop enhancements include support for new file types including images and formatted text and extend the existing ability to drag and drop files to a broader set of guest and host operating systems. 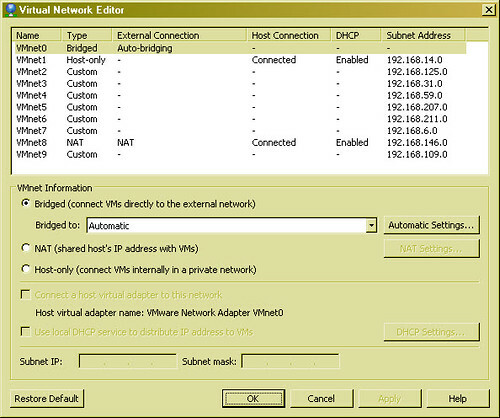 Virtual Network Editor — User interface enhancements have simplified creating and configuring virtual networks. Fuse Mount for Linux — Use Fuse to mount .vmdk disks on to the file system of Linux hosts. Simplified Collection of Support Information — Gather detailed information about multiple virtual machines and the host machine at the same time. The information is packaged in a compressed file so that you can email it to VMware support or post it on the VMware Workstation forums. IPv6 Support — Create a bridged connection to an IPv6 network on VMware Workstation virtual machines. Replay Debugging — Enhancements in replay debugging make the feature faster and easier to use. Developers can attach to a particular process instance, attach to a process in the middle of a recording, and ensure that the executables and symbols on the host machine match the guest. Developers can remotely view the exact state of the machine when the system failed and replay the recording to see the circumstances that led the system to fail. For more information about replay debugging, see the new Integrated Virtual Debugger for Visual Studio Developer’s Guide and technical note for Replay Debugging on Linux . SpringSource Tools Suite Integration — Use the latest version of the SpringSource Tools Suite to run and debug Java applications in a VMware Workstation virtual machine without leaving the development environment. You can download the latest SpringSource Tools Suite from the Spring Source Web site. Remotely Debug C and C++ Applications for Eclipse — Set a remote debugging session inside a controlled C and C++ environment where the guest operating system is different from the host. For more information about remotely debugging C and C++ for Eclipse, see the Integrated Virtual Debugger for Eclipse Developer’s Guide . VMware Tools Configuration Utility – Use the new VMware Tools command-line interface (CLI) to automate configuration of VMware Tools in guest operating systems. With CLI you can modify VMware Tools settings, shrink virtual disks, connect and disconnect virtual devices, and more. For information on the VMware Tools configuration utility, see the new VMware Tools Configuration Utility User’s Guide. There is some good stuff in this release. More than I originally thought. I’d like to take this moment to admit guilt in showing a lack of enthusiasm when Workstation 7 was first launched. My initial understanding of the major new features amounted to Aero support and VMware ESX as a guest OS. My reaction was “who cares”. I take it back. This is a solid release with increased configuration maximums as well as new and improved features.